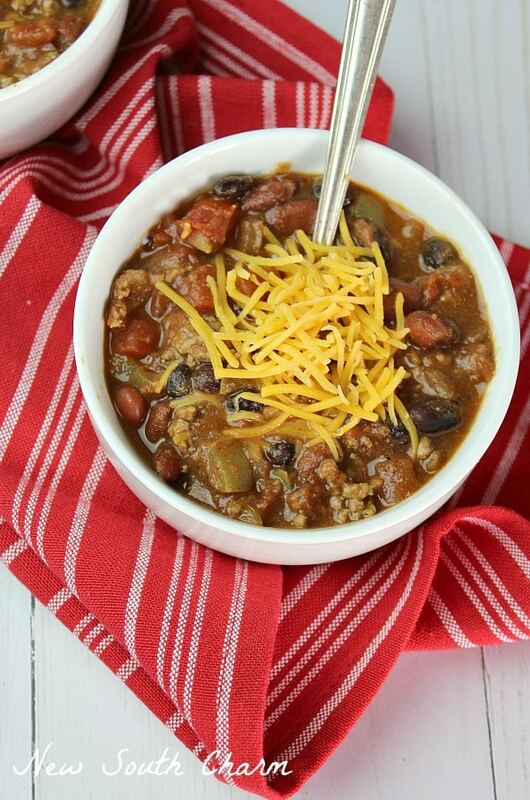 This 30 Minute One Pot Chili is my go to recipe in the fall and winter months. It a super easy flavor packed recipe you can have on the table in just 30 minutes. The official start of Fall is about a week away. That can only mean one thing at my house it’s time for chili. In the cooler months chili is my go to meal. We love chili here and I love to make it. 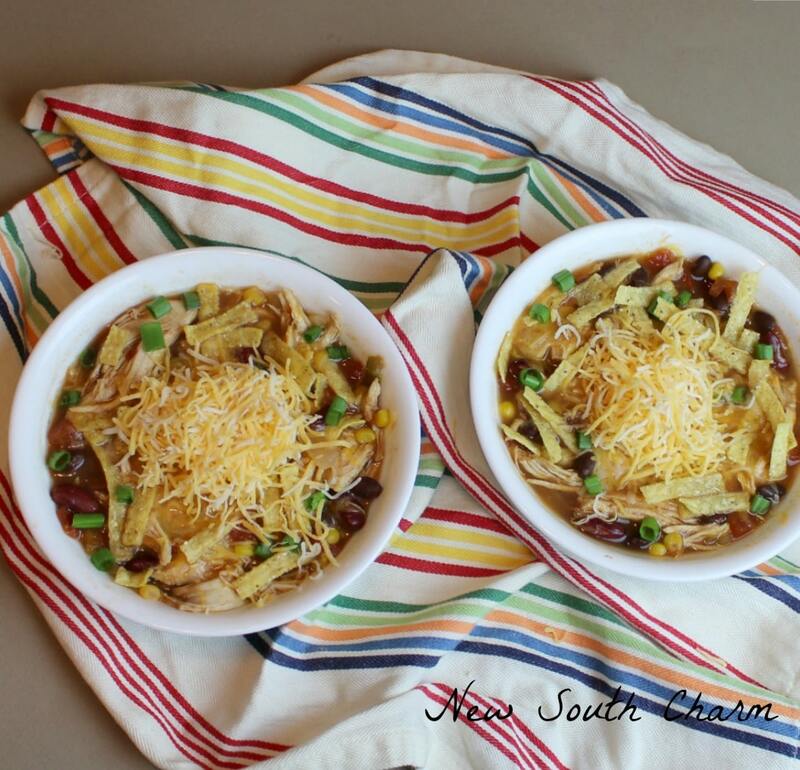 This recipe is my go to recipe for busy nights when the weather gets cooler. I even been known to make this in the summertime because it’s so easy and doesn’t require turning on the oven. Just a fun fact: traditional chili is actually a dish that is made beans, tomatoes, and seasoning but without meat. Did you know that? I didn’t, it was something I heard on TV the other day. I’m betting that most of you, like me, have always had some sort of ground beef or ground turkey in your chili. To begin this recipe begin with melting a teaspoon of butter in the bottom of a large pot or dutch oven. If you don’t like to cook with butter or you want a healthier alternative you could use a teaspoon of Olive Oil. I prefer butter because it does add a rich flavor to the beef. Once you’ve prepped the pot add the onion, pepper, and garlic to the pot and cook for two to three minutes until the garlic and onions are transparent and the peppers are tender. Add beef or turkey to pot and brown. Drain excess fat. After the beef is browned add seasonings and Worcestershire sauce mixing until meat is throughly coated. Add in both cans of tomatoes and stir until combined. Repeat with both can of beans. Bring contents of pot to a boil. Cover and reduce heat. Simmer for fifteen minutes. I like to garnish with cheese and scallions but it’s great with crackers or freshly sliced jalapeños. 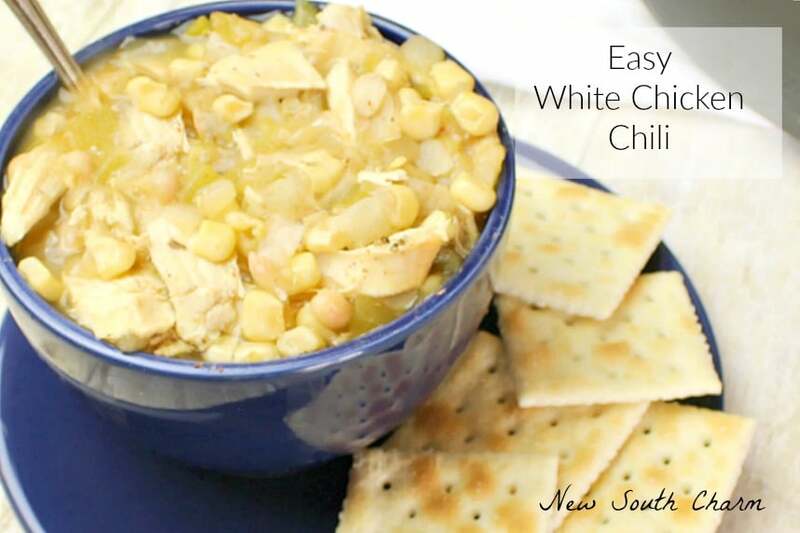 Looking for more great CHILI RECIPES? I love the cooler weather too, Quinn. Your chili looks really good. Thank you for sharing. I have never thought about putting black beans in my chili. I will have to give this a try. You should defiantly try the black beans. Not only does it add more color the extra protein makes it more filling. Mmmm looks delicious! I love on-pot meals so much! And chili in the fall is a must! I agree Chrissa, you MUST have chili in the fall. In fact we’ll probably have it a few times. 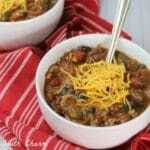 With the temps going down 70* and with fall in my head, I am thinking chili, and yours looks delicious!! And I am featuring your post on my Friday Features this week. Would love to have you stop by and link your other lovely posts. 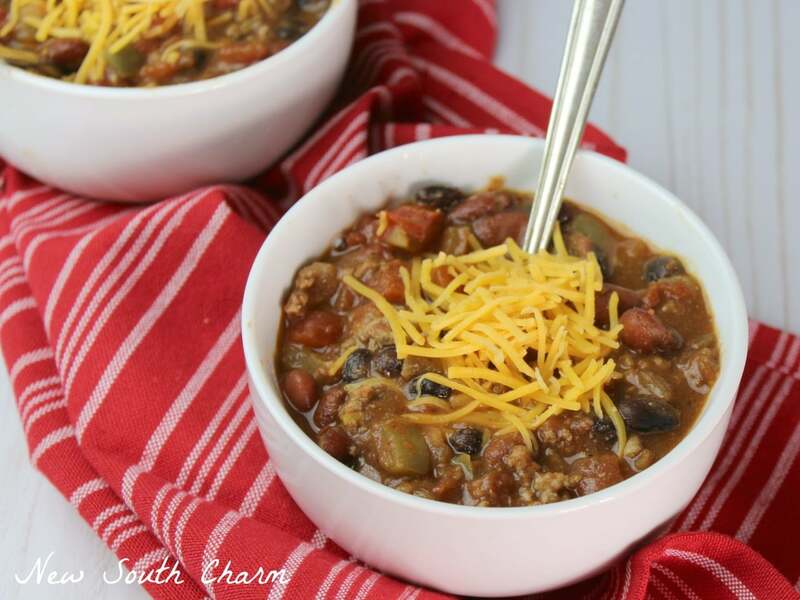 Delicious one pot chili love to try it, thanks for sharing with hearth and soul blog hop pinning. 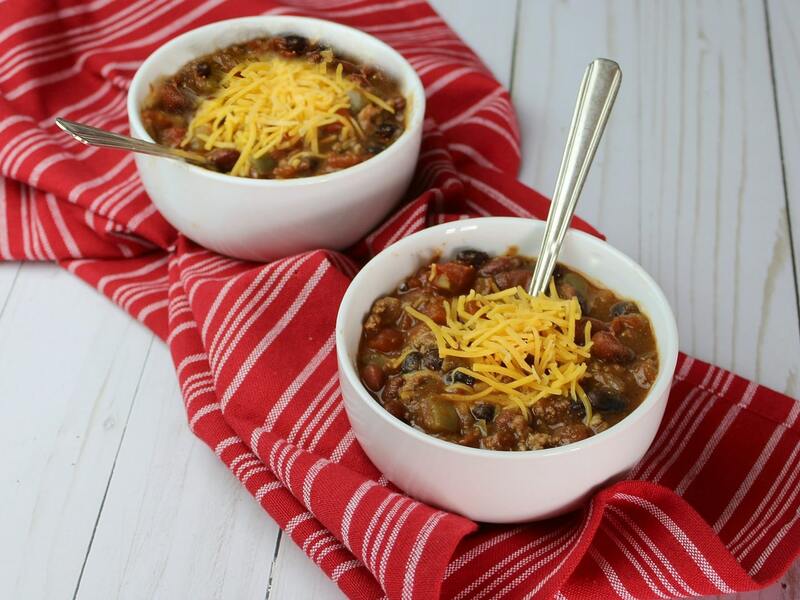 There is nothing better than a great pot of Chili, this looks delicious! Thanks so much for sharing with Full Plate Thursday and have a wonderful day. I love it and 30 mins to make it’s even better. Thank you for sharing at Dishing it and Digging it link party.